« Chrysler needn’t pay last $1.3 billion owed to U.S.
“Workers stand in the shadow of what will become the world’s largest-diameter tunnel boring machine. 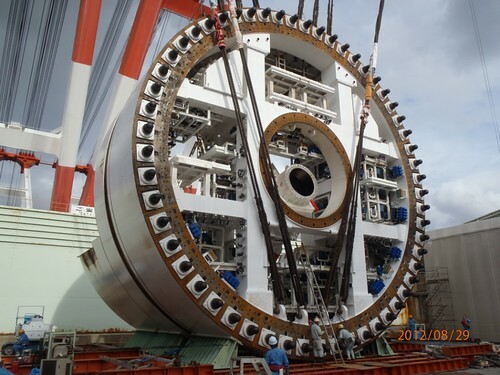 Currently being assembled in Japan, the machine will dig the (State Route) 99 tunnel beneath downtown Seattle starting in summer 2013. Scheduled to open to traffic in late 2015, the tunnel will replace the central waterfront section of the Alaskan Way Viaduct. WSDOT’s SR 99 tunnel project page and document library. WSDOT’s SR 99 “Preparing For Tunnel Construction” Flickr photo vault. Public Data Ferret’s Washington State+Transportation archive. Share | Permalink | Comments Off on Now THAT’S Boring!